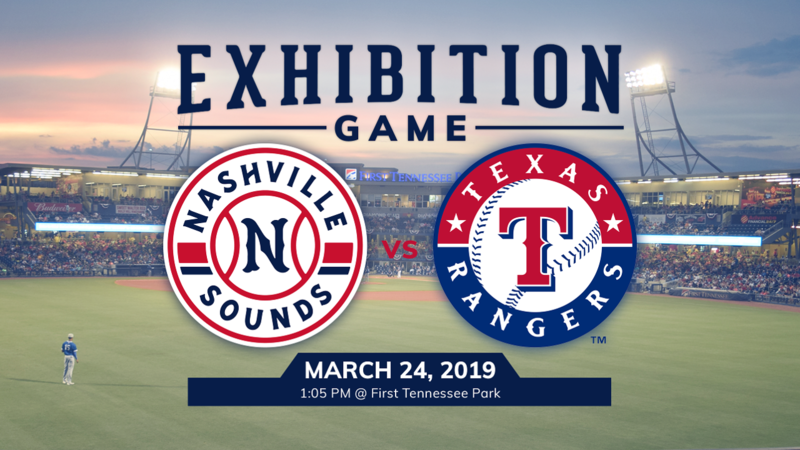 The Nashville Sounds announced today the on-sale date and ticket options for the Major League Baseball exhibition game between the Sounds and Texas Rangers at First Tennessee Park on Sunday, March 24 at 1:05 p.m. Fans can choose between a Club Level seat in sections 201-216 for $75 or a Diamond Club Level seat in sections 208-210 for $80. This offer is available online only here. Limited quantity available. Remaining tickets will be available for purchase on Monday, February 25 at 9:00 a.m. Tickets begin at $20 for a Corner Section seat. Other available sections include Select ($25), Dugout ($27), Premium ($33), Club ($40) and Diamond Club ($43). Sales tax not included in ticket prices. Exhibition game ticket prices are subject to dynamic pricing. Group discounts are available for Premium, Dugout, Select and Corner Section seats. 20-100 tickets receive $1 off per ticket and 100+ tickets receive $2 off per ticket. General admission tickets are not available until the Sounds' ticket office opens on Sunday, March 24. Seniors and military families can enjoy a $2.00 discount to the Major League exhibition game. The offer is valid for any reserved seat section - subject to availability. Offer valid for up to four (4) tickets per I.D. (Seniors 55 +, government-issued military I.D. required at ticket office; no phone orders). A Major League Baseball exhibition game has not been played in Nashville since June 3, 1999 when the Sounds hosted the Pittsburgh Pirates at Greer Stadium.